My plan for this weekend (may or may not get done). 1) Shortcakes with fresh fruit and pomegranate whipped cream. -I thought this would be an interesting take on a hamburger. Instead of a bun, you have shortcakes, and instead of meat, you have whipped cream and fresh fruit. 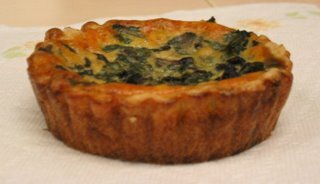 2) Mini white wine spinach portabella quiches. 4) Mini tiramisus in transparent plastic cups. 5) Dungeness crab cakes with buttermilk biscuits, and roasted red pepper sauce. Okeydokey, first off, the Pate Brisee (Short Crust Pastry) recipe, to be used for quiches and other savory tarts. Blend in food processor (or use the back of a fork/two knives to dice up the butter into the flour). Gradually add in water, and remove from food processor when the dough starts to stick together. Work the dough out on a floured surface (like my Roul'Pat, or any counter). Refrigerate 30 minutes to 1 hour before using. Roll out a clump for usage, fill tart/pie shell, cut off excess. Prick holes with fork, fill tart pans with pie weights or dried beans, let refrigerate for 20 minutes before baking to relax the gluten. Try not to stretch the dough too much, or else it will shrink during baking. Bake ~ 20 minutes at 350 degrees F (depends on your oven) until LIGHTLY browned. After the pie shells have been baked (usually the day before), sautee together chopped baby spinach leaves, mushrooms, and other items of your choice (seafood, bacon, onions, etc...). Add in some white wine. Make another separate mixture of 4 eggs and 2 cups of half/half (or light cream). Add in shredded/cubed cheese into the bottom of each tart pan. 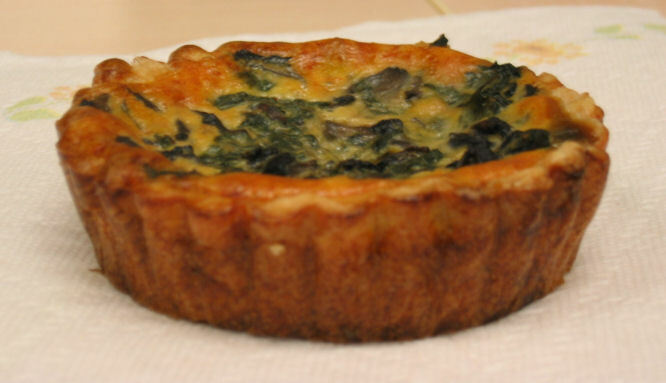 Add spinach/mushroom mixture to each quiche. Then fill with egg/half and half up to the top. Bake at 350 degrees for ~ 40 minutes, or until quiches are set and a knife inserted into the center comes out clean. Non-stick quiche pans with removable bottoms work best!